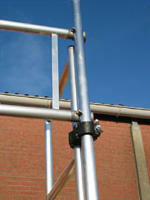 Web site marketing work is like scaffolding. You can skip it, but every effort you undertake after that will require much more effort. Savings are an illusion. As anyone in the construction trade will tell you, scaffolding is essential. It costs time and money to erect, rent or buy, and disassemble. But once it is properly placed, everything else goes smoothly. You can do a better job of painting, installing, removing, etc. on the 2nd floor. Not being able to justify SEO work is a bit like trying to work on a 2-story house without the budget for scaffolding. Everything else gets harder. You must work twice or three times as hard to do any task. It’s less safe, it wears down your staff, and makes you late for your goals. It’s really hard to figure out the best way to package SEO, and I’m open to any feedback others might have. Right now, hourly makes sense. I’d love to find useful packages, but there are so many differences between clients and it might be an unacceptable compromise.